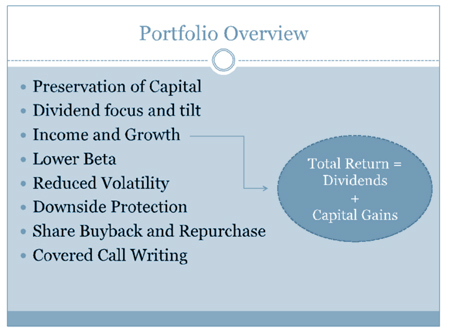 Dividend Focus is an investment strategy that focuses on selecting individual securities that have a history of consistently increasing dividends over time. The majority of the stocks that are selected for the portfolio are large cap, blue chip names that have increased the dollar amount of dividends that they pay shareholder each year. The portfolio seeks an above average dividend yield relative to the S&P 500 and seeks both current income and capital appreciation to generate returns for shareholders. 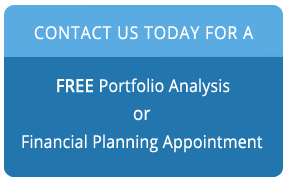 The strategy will also use covered call writing from time to time to enhance the current income component of the overall return of the portfolio. The Dividend Focus strategy seeks to outperform the S&P 500 and the Russell 1000 value index on a total return basis over a 3-5 year rolling time period in addition to providing a level of current income that is greater than the dividend yield of the S&P 500. The account is broadly diversified across the bulk of the S&P 500 GICS sectors and will typically hold between 16 and 20 names in the portfolio. Companies that have raised dividends for a minimum of ten consecutive years. The majority of securities in the portfolio have increased dividends to shareholders for over twenty years in a row. We tend to favor securities that are actively involved in share buyback programs that decrease the number of shares that are outstanding over time.